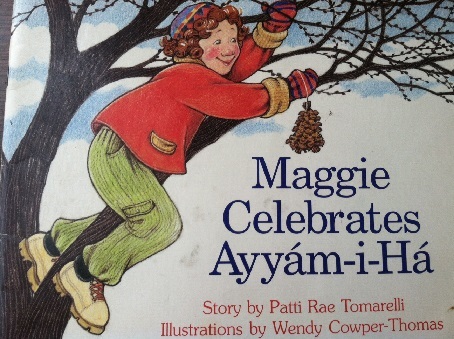 When Patti Rae Tomarelli’s picture book, Maggie Celebrates Ayyám-i-Há, appeared in 2000, my daughter was only three years old. We were living in a community in which Christmas was the focal point of the year, so I wanted to do something to make the Bahá’í celebration of Ayyám-i-Há special for her. Tomarelli’s book, with its lively illustrations and engaging story about the plans a small child makes for celebrating this Bahá’í season of gift giving and charitable deeds, seemed to be the perfect place to start. At first, I simply read the book to my daughter, then we would choose to do one of the activities described at the back, such as making a bird feeder. When she went to kindergarten at the Montessori School, I brought the book to school and read it to her class as part of a presentation I gave to introduce children to Ayyám-i-Há. The kids loved the story. Then it occurred to me that the central character, Maggie, with her overalls and wild, red hair, would make a perfect puppet. The next year, in the days just before Ayyám-i-Há, we took the back off an old kitchen cupboard we found in the basement, painted the cupboard red, sewed a hem on a piece of green fabric and ran a string through it. Voila — a puppet theatre! We searched the toy box for props — a rubber pig for Maggie’s piggy bank, a plastic hammer for breaking it open, a pine cone for Maggie’s bird feeder, a miniature flower pot in which Maggie could grow the flowers she gives her friends and family, and a small tin for the cookies Maggie makes for her neighbors. The show ran for six years, and every year, the children were enthralled by the opening scene in which Maggie welcomes Ayyám-i-Há at sunset on February 25th with a “dance of jubilation” and a prayer of celebration. When my daughter and her classmates outgrew the puppet show, we still followed Maggie’s lead by going outside to watch the sun set on the first evening of Ayyám-i-Há. And while we didn’t exactly do the dance of jubilation, we celebrated by saying the prayer for Ayyám-i-Há and, afterwards, thinking joyful thoughts as we sipped our hot chocolate. When our time at the Montessori school was over, I presented a fresh copy of Maggie Celebrates Ayyám-i-Há to the Montessori teacher who had welcomed our puppet show all those years, with a photo of my daughter and me looking jubilant, after one of our puppet shows, pasted in the front of the book. I still come by the Montessori school some years to read the book to the children. And if I can’t come, the teacher will read it to the children herself. Maggie Celebrates Ayyám-i-Há has been and continues to be a source of joy to my family and our community, and I want to take this occasion to say, thank you, Maggie. And thank you, Patti Rae Tomarelli, for helping us find ways to make the celebration of Ayyám-i-Há special for our children. — Tomarelli, Patti Rae. Maggie Celebrates Ayyám-i-Há (Bellwood Press: Evanston, 2000). © 2019 e*lix*ir journal. No re-use authorized without the express written permission of the e*lix*ir journal editor and the artist.